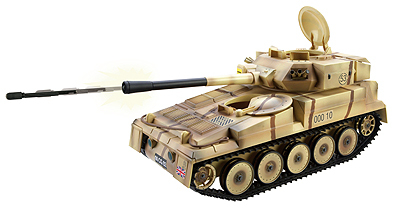 The Army Battle Tank is the first vehicle to be released in Character’s HMAF toys army range. The design of the Fast Pursuit Tactical Battle Tank incorporates elements from both the British Army’s main battle tank, Challenger 2 as well as from the Scimitar Armoured Reconnaissance Vehicle. The HMAF Battle Tank comes with a spring loaded missile which fires from a switch on the turret. The turret itself rotates. The HMAF tank has two opening hatches for the 10 inch scale HMAF figures. It also features an opening equipment box suitable for storing weapons and accessories. The HM Armed Forces Tactical Battle Tank comes in desert camouflage livery and features realistic working rubber tank tracks.